Double Fine is always trying something new. The developer regularly invites employees to pitch their game ideas during its annual Amnesia Fortnight events, internal game jams where no idea is too bizarre. Several well-regarded games have resulted from ideas that started at this event, titles such as Costume Quest and Stacking. Since 2014, the company has also begun to champion lesser known indie developers through its "Double Fine Presents" program, giving small games that fit within the company's ideals a huge signal boost. 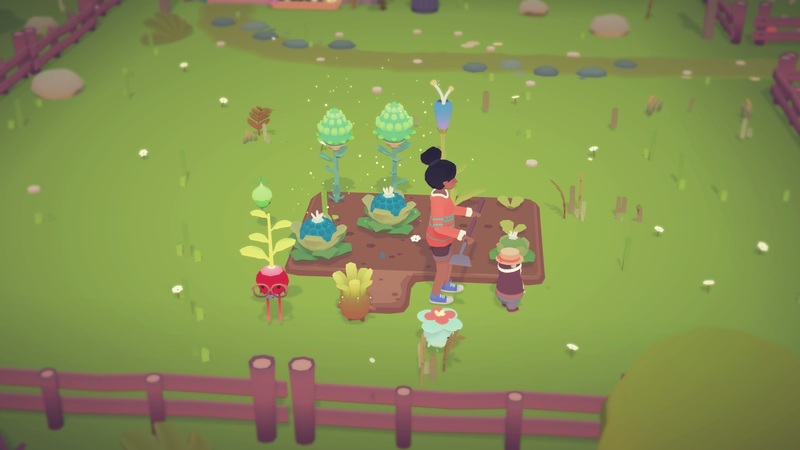 Ooblets is one of the latter, a charming mashup of some mostly non-violent games which should appeal to younger gamers in particular. I got to try it out at PAX last weekend, and it's one of the most relaxing games I've ever played. When I sat down to play Ooblets, I was told the game is a mashup of Pokémon, Stardew Valley, and Animal Crossing. "I like all of those things," I replied, and eagerly picked up the controller. The first step in Ooblets is to create your character, which consists of choosing a gender, skin color, starting outfit, and hairstyle. Naturally, I picked a balding man with a hideously patterned sweater and deep blue skin. "Everyone picks blue," noted one of the developers. "Maybe we should put some other weird colors in there." Once my avatar was created, I was escorted to the island where Ooblets live and play. Ooblets are small creatures who grow from seeds and will follow humans around and interact with them. None of them seems to grow more than about a foot tall, and they each have some different attributes and abilities based on what type of creature they are. The boat ride to the island was very reminiscent of your introduction to the town in Animal Crossing, and my first contact after stepping off the boat was the town's mayor. 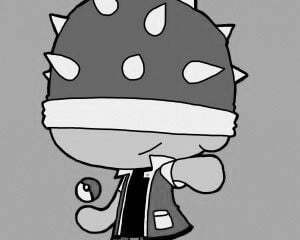 She showed me around a bit and gave me my first Ooblet seed, encouraging me to plant it at the abandoned farm on the outskirts of town. I was also provided some regular vegetable seeds and farming tools, and set out to begin working the land. After tilling the soil and planting and watering my seeds, I was encouraged to rest. Upon awakening some hours later, I discovered I had some veggies and a tiny creature that would follow me around. My first Ooblet was something called a Clomper, and it seemed content to stay a few steps behind me as I explored more of the island. Eventually we made our way to the town's shop, who bought my veggies and sold me the seeds to plant some more. I had some extra cash after this transaction, so I made my way to a gacha machine and bought a tiny pirate hat for my Clomper. I noticed some more people with Ooblets in the town square, so I wandered over to see what they were up to. This is when I was introduced to Ooblets' combat mechanics, which take the form of a card-based dance battle. The objective is to drain your opponent's "Ego" by hitting them with your freshest moves. 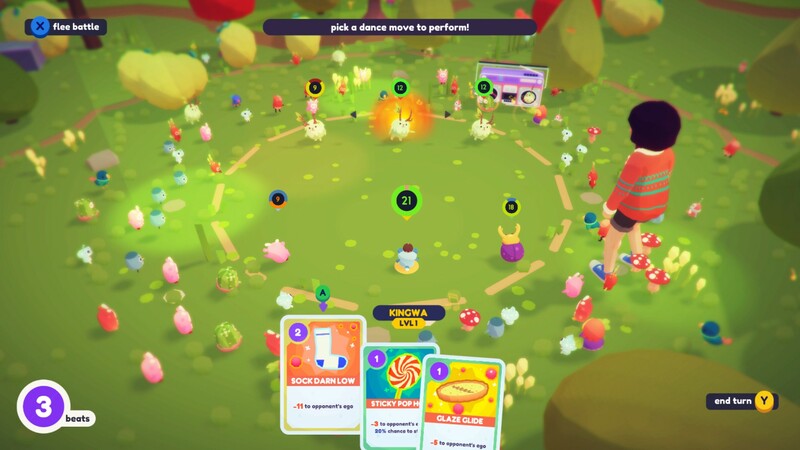 Ooblets in a dance battle take turns playing some moves from a hidden deck of cards, and each move has an ability point cost of zero to three "beats." More powerful cards will require more beats, but there's no penalty if you don't use all your beats in a single turn. You don't get to save beats though, so you need to use them or lose them every time it's your Ooblet's turn to act. Leveling up an Ooblet will let it earn more cards for its battle deck, and each set of cards is unique to that particular Ooblet type. Beating an opposing Ooblet has the chance to make them drop a seed, and this appears to be the main way to expand your party. Dance battles can be 1v1, 2v2, or 3v3, though I only played 1v1 and 2v2 battles during my demo. Just like in Pokémon's multi-battles, it seems like a good strategy to focus fire on a single opponent so it won't get a chance to react. Other, non-aligned Ooblets will crowd around during a dance battle, and it's pretty cute watching them all sway in time with the music. 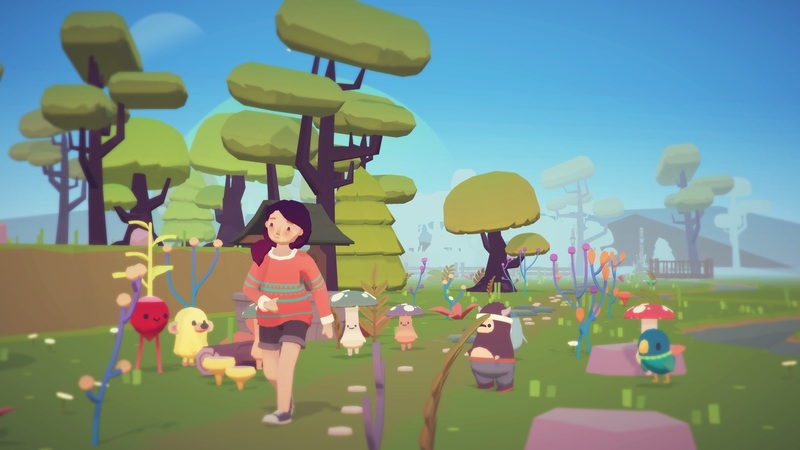 Ooblets has a friendly, soft aesthetic that appears to be heavily influenced by shows like Adventure Time. The gameplay loop is pretty solid, reminding me of other light farming games like Viva Piñata and Harvest Moon. I didn't get to try out the decoration part of the game, but it sounds like you'll have a personal space you can furnish and personalize, just like Animal Crossing. It's already quite relaxing to explore the island and work on the farm, and the low-key battling doesn't take away from the mellow atmosphere. Ooblets is currently in development for the PC and Xbox One, and should be released some time in 2019.